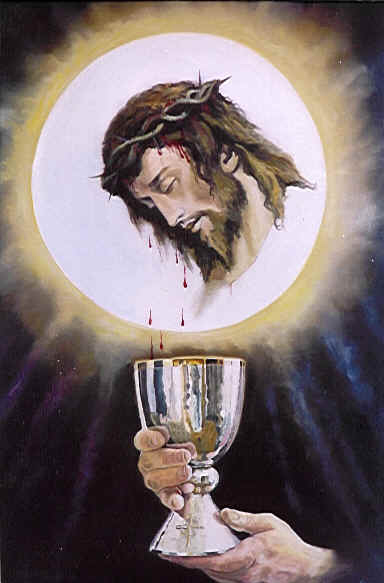 As Catholics, we believe that Holy Communion is not just "bread" and "wine" - it is no mere symbol - but it is the real body, blood, soul and divinity of Our Lord Jesus Christ. He is as present in Holy Communion as when He walked the earth. To receive Communion is to receive the Lord into our souls. Thus, we must take great care to ensure we receive Communion with reverence, remembering Whom it is we receive. Click here to listen to a talk explaining the Eucharist. First Holy Communion preparation in our parish is conducted for children in school year 3 and above. The programme begins each autumn and runs until the following summer. Sessions are conducted for parents as well as the children themselves, to help ensure that each child is properly disposed. Reception of the Sacrament of Reconciliation is a pre-requisite for First Communion, and children will also be prepared for this as part of the Communion programme. Look out for notices in the newsletter or speak to one of the priests for more information. If you are a non-Catholic adult seeking to enter the Catholic Church, visit the RCIA page, or contact one of the priests to discuss your situation.